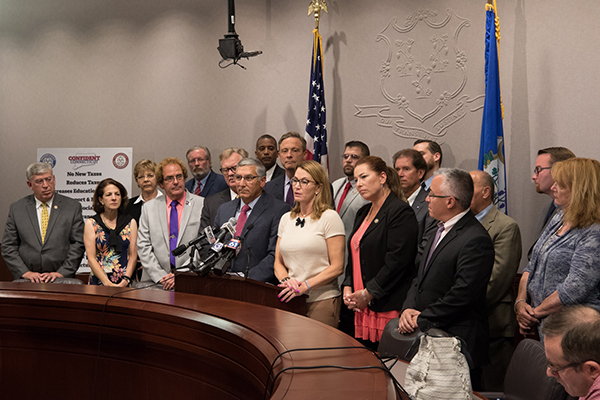 HARTFORD – Connecticut House and Senate Republicans on Sept. 12 joined together to release a revised two-year state budget proposal with no new taxes that would put a stop to the governor’s executive order, restore funding for education and core social services, and provide stability for towns and cities. The revised budget includes no tax increases and rejects the governor’s proposal to shift teacher pension costs onto towns and cities that would further burden municipalities and lead to increased property taxes. The Republican budget proposal combines elements of the Senate and House Republicans’ multiple prior budget proposals, feedback from Democrats, and factors in the legislature’s passage of the state employee labor concessions deal that is now law. The original Republican budget was first released in April and updated throughout the year as the state’s financial situation changed. “We believe it is in our state’s best interest for lawmakers to come together and pass a bipartisan budget, which is why we have worked for months to try to negotiate a deal with Democrats that truly moves our state forward. But Democrat legislators made it clear they would rather work with Gov. Malloy than their Republican colleagues and pass a budget that relies on the same policies that have failed our state in the past,” the Republican leaders added. It also rejects the governor’s proposal to shift teacher pension costs onto municipalities as such a policy change would likely result in property tax increases. Restores funding for core social services and programs that benefit people most in need. Fully funds day and employment services for individuals with intellectual and developmental disabilities, reopens Care4Kids, etc. Prioritizes the state’s transportation needs and stabilizes funding without tolls or new taxes. Implements the Republican Prioritize Progress transportation funding plan and stabilizes the state’s Special Transportation Plan. Lowers taxes for retirees by eliminating tax on social security for middle class families and phases out pension income tax for those with incomes below a specified threshold. Helps seniors age in place by restoring and increasing funding for core programs and supports such as Meals on Wheels, the personal needs allowance, non ADA dial a ride, and the CT Home Care Program. ?️ Watch our full news conference on CT-N.